Trailing behind the previous films is The Hangover III, which gets going on the same tracks as before, but somehow ends up at a different station. 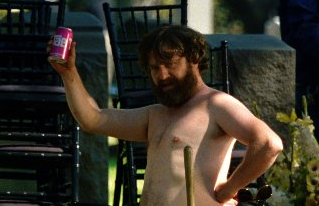 “Alan” (Galifianakis) has been off his meds for six months. When he tries to bring a giraffe home, everyone dear to him is reg-flagged as to the seriousness of his worsening retraction from normalcy, resulting in an intervention. After the death of his father (Jeffrey Tambor), a trip is arranged and Alan agrees to go to Arizona to a treatment center, but trouble finds the fateful four on the road when drug kingpin “Marshall” (John Goodman) takes “Doug” (Bartha) as collateral while “Phil” (Cooper), “Stu” (Helms), and Alan are forced to retrieve his missing $21,000,000 in stolen gold bars—stolen by prison escapee “Mr. Chow” (Ken Jeong) whom viewers will colorfully remember from the first and second films. Chow is here the biggest show-stealer on camera, followed by Galifianakis’ irreplaceable Alan. There’s just no failing to love the both of them! The chase leads them into lots of expected troubles in Tijuana and eventually back into Las Vegas, re-treading old ground, even reuniting with “Jade” (Heather Graham) and stopping along the way to fetch a love interest for Alan, “Cassie” (Melissa McCarthy), an eccentric, attitude-y pawn shop owner. Now all may seem fine and good in Hangover-ville, but more than a few fans will be put off by no wild, forgetful nights of substance abuse of any kind. There is no hangover in Hangover III! It has no big, crazy party—at least not one that the three main men get invited to. And when they show up, they are at the top of Caesar’s Palace dangling for their lives. It has enough of a story to totally bury two hours of your life with a few big LOLs to push away the comedic cafafuls and otherwise laugh-challenged, airy screen-time that seems to want to stay around. These spacey interims can be like awkward elevator moments. So the laughs may not be as hard, the pacing may not be as great, and the eye-rolling moments may be the last thing a viewer remembers, but one could do worse than Hangover III, especially if they long to see the completion of the series and enjoy watching events unfold that likely would never make it to reality on the nuttiest of goofy nights. 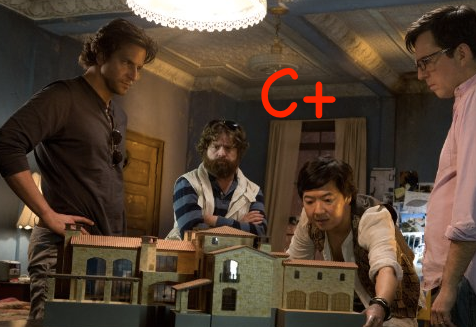 What is commendable is the balls it took for director Todd Phillips (Hangover II, Due Date, Hangover) to break the mould and not have everyone get whacked out again. And although it should be viewed with significantly lower expectations, Part III does offer a remotely amusing time at the movies with one or two small surprises before it’s over.